Way ahead of its time, the original edition of this book, Against the Grain, was the first book of its kind: a funny, supportive, and absolutely essential handbook for gluten-free living. With two successful editions and countless devoted fans, this book has helped thousands of gluten-free readers follow their diets with creativity, resourcefulness, and, always, good humor. The Gluten-Free Revolution is fully revised and updated with the newest resources and information, and is packed with authoritative, practical advice for every aspect of living without gluten. With her signature wit and style, Lowell guides readers through the intricacies of shopping; understanding labels, from cosmetics to prescription drugs; strategies for eating out happily and preparing food safely at home; advice about combining gluten-free eating with any other diet, like gluten-free-paleo and gluten-free-dairy-free; negotiating complicated emotional and interpersonal reactions to your new diet; and includes fabulous gluten-free recipes from the best chefs in the world, including Thomas Keller, Rick Bayless, Alice Waters, Bobby Flay, and Nigella Lawson, among many others. 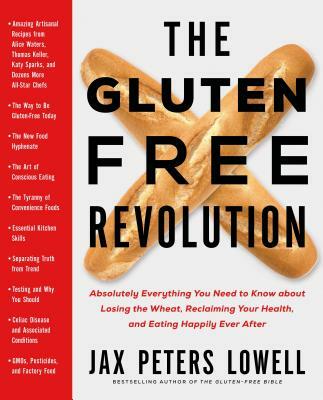 The Gluten-Free Revolution remains the ultimate and indispensable resource for navigating your gluten-free life.